I and Neelam (she is the most regular one!) often volunteer at a government blind school and hostel here in Vadodara. The hostel doubles up as a hostel for physically challenged children as well so we have a mixed group of children. We have been allowed by the warden to visit and spend with children on two evenings in a month. Since the time is after their classes and study time is over, we tend only to play games in the couple of hours that we have. But it is always so much fun to spend time with them. A lot of time our own creativity and patience is brought into question when playing with the visually and physically challenged and there is always something new that we learn from them. They look forward to our visit and we wish we would be allowed to go there more than twice a month but those are the regulations we need to observe! So what games do we play? We have to take care that the games are inclusive for all. When playing we are a mix of volunteers, visually challenged children and physically challenged children. They have a ball with marbles inside it so it makes noise when thrown. Most often we used to play cricket, ball, blindfold run & catch and passing the parcel. It’s amazing to see them perform when they lose at passing the parcel! We had no talent in front of them! They would know every new song and every dialogue from the movies! At some times we would sing in teams something like antrakshari. But lately we have started to introduce some creative activities. All the children are boys and we thought they wouldn’t like painting etc but we were totally wrong! I first heard about tactile graphics for blind from Prarthana when they did tactile calendars as gifts for visually challenged people in Bangalore. As soon as I gave the idea to Neelam, she was all for it and we decided we were going to try it! Now usually we have anywhere between 12-15 children when we go but on that day we had a full house with around 35 children and on that particular day we were only 2 volunteers! We didn’t have as many chart papers or even supplies so we decided to divide them into mixed teams. Each team (4-5 children) was to have both visually and physically challenged children. We then divided the material between them and told them to ‘draw’ something with those. At first we had to move between the groups to get them started with ideas and material. 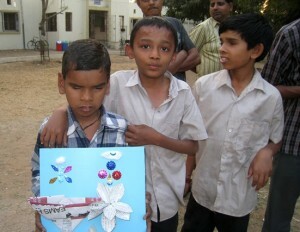 Some physically challenged children didn’t want to draw but do some paper art, so we gave them old newspapers. After the first 15 minutes, the place was brimming with action, every team trying out their best, some trying to peep into what others are making. What was amazing to see was the coordination between sighted and non-sighted children in the same team. At no point was anybody left out! And they improvised. They made ribbons and other shapes from cloth and clouds with cotton. Since the material was limited, they used grass, leaves, twigs and branches from the garden. Below are some pictures to show their talent! The children who had newspapers also amazed us by their artistic talent. We had beautiful trees, flowers, guns, frogs etc made from old newspapers and they gifted them to both of us! 🙂 Later we cleaned up the entire area to remove any waste material and collected everything that could be used again. At the end of it I was wondering at my initial inhibition of trying something new with them. 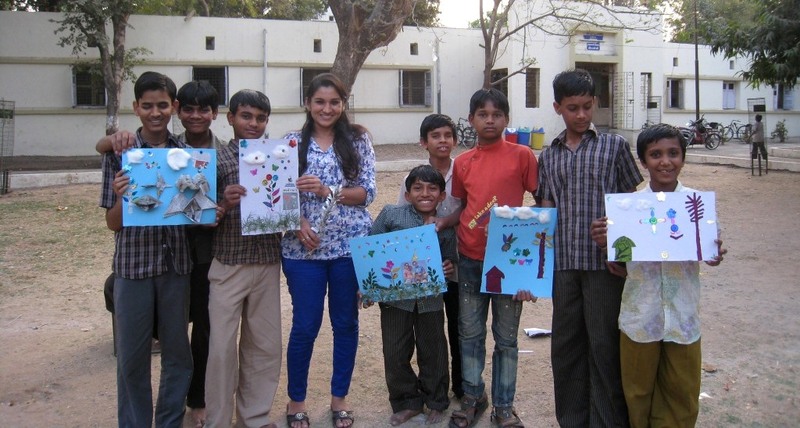 Some of the hostel staff also came out to see the masterpieces the children had created! Volunteering with children is always fun and enjoyable; but volunteering with children with disabilities brings on a whole new experience. It was such a delight to see that they have learnt something new; to go beyond the everyday games which they play even when we are not there. Since then we have also tried clay modeling and it has been a great success as well! Any more art ideas? Do you volunteer with children with disabilities? Do share the activities you engage in with them. We are always looking out for inclusive games and would love to read your experience and learn new things! 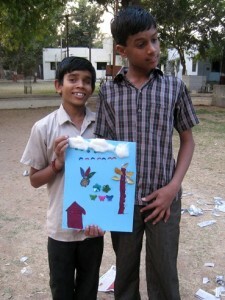 4 Responses to "Tactile Art with visually challenged children"
The idea came from your event! All the best with gift-abled! Feels so good to see the progress you have already made with it! Here is what I did once – this is a group art activity. The group has 2-3 children, of which at least one is partially sighted. We take a hard board canvas / chart paper (canvas for the first time) . Then, we stick dori to it in basic shapes (triangle and rectangle are great starts). Next, we take poster colors and teach the children to understand viscosity from how freely the brush is moving in the bottle. Braille labels on the caps and labels of each color are a must to allow children to pack away their own art set. Once that is done, we encourage the children to feel along the dori for the border of the shape and to paint inside the dori. We start with straight shapes and slowly introduce elements of curve and the third one I did was “Om” in Hindi, with a dark color inside and a lighter tint outside the om. they looked very pretty and the dori made a natural highlight. 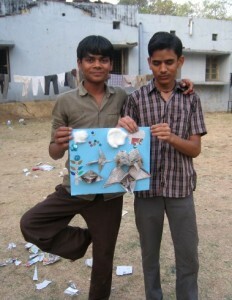 see if u want to do this.. apparently, the same technique was tried at the Gurgaon blind school by their then principal. When we exchanged notes, we were amazed to find that we thought of the exact same thing.. outline with dori and viscosity through the brush. We even taught them to measure parts of color and mix their own colors from the basic 12 color box. That’s so nice! 🙂 Thanks for sharing Esha! Do you have pictures of the activity? We would love to write about this activity and share with more volunteers who are looking for ideas for creative activities with visually challenged children..